Wiki Info: The Moto Z features an accessory system known as “Moto Mods”. Mods are case-like accessories that are attached to the rear of the Moto Z via a series of magnets. Using the pogo pin connectors, Mods can communicate with the device to provide additional functionality. Mods are hot-swappable and are automatically detected by the operating system software once installed. During the launch event, Lenovo unveiled several mods to be available on launch, including battery packs, the “SoundBoost” (which features a JBL speaker and a kickstand), and a pico projector (“Insta-Share”). 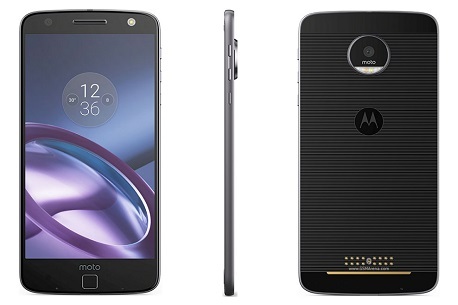 All Moto Z devices ship with a “Style Shell”—a basic rear cover, as well as a clear, plastic “bumper” case that protects the bezel of the device. Lenovo will allow third-party development of Mod and plans to provide US$1 million in funding to the best prototype concept as part of a contest. Final Verdict: While it could be said Motorola Moto Z is one of the better modular smartphones, it’s not the best smartphone in almost every other way. In VR it looks pretty average and its mid-range battery and display are OK, but nothing standout. The good news is its one of the cheapest smartphones that is Google Daydream ready making it a great smartphone for anyone wanting to get into Daydream apps and games. While probably not the best daily driver in almost every other kind of way it still plays most Google Daydream games with ease. The perfect smartphone for anyone on a budget, but still wanting a Daydream ready phone.